The sturdy and stylish Station One Chair is the perfect pint-sized chair for tots to stack blocks on, climb on, hold court at a tea party, or of course sit on with a favorite book. Designed for both fun and function, the Station One Chair features an open space under the seat that doubles as storage for books — or it may become a tunnel for toy cars and trains, or even serve as an imaginative cave for stuffed animals. 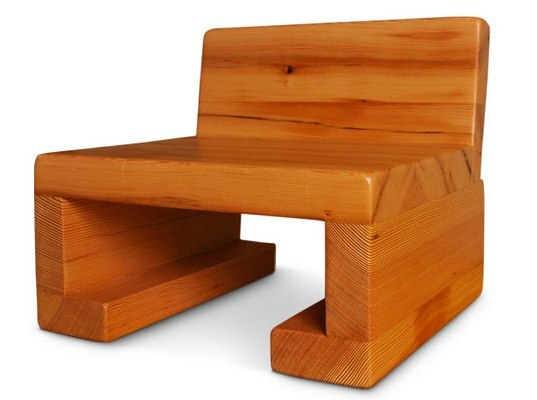 Made by Make Believe Company from reclaimed clear vertical grain Doug Fir 2×4’s and finished with a non-toxic, hand rubbed satin finish, the Station One Chair‘s simplicity makes it an instant heirloom piece. With a low seat height of 7 inches off the ground, this chair is even suitable for very young, tumbling tots of one year or older. The sturdy and stylish Station One Chair is the perfect pint-sized chair for tots to stack blocks on, climb on, hold court at a tea party, or of course sit on with a favorite book. Designed for both fun and function, the Station One Chair features an open space under the seat that doubles as storage for books -- or it may become a tunnel for toy cars and trains, or even serve as an imaginative cave for stuffed animals. Made by Make Believe Company from reclaimed clear vertical grain Doug Fir 2x4's and finished with a non-toxic, hand rubbed satin finish, the Station One Chair's simplicity makes it an instant heirloom piece. With a low seat height of 7 inches off the ground, this chair is even suitable for very young, tumbling tots of one year or older.